When Can New Students Start? We are a year round program. New students may start at any time throughout the year. If you start in the middle of the session your tuition will be prorated to put you on the same schedule as the rest of the gym. Tuition is due monthly. Here at All Starz we run on an autopay system. We will run an automatic payment through your bank account or VISA/MC/AMEX. This will be done on the 25th of the month prior to the next month the student wishes to attend classes. A credit card on file is REQUIRED for all student accounts. If you do not wish to have your tuition run automatically on any month you are welcome to come in & pay prior to the 25th with cash or check. You may also log on through our website through our parent portal & pay manually anytime. To do so go to www.allstarzacademy.com, scroll to the bottom of the homepage & click on parent login under the heading parent portal. If it is your first time logging in through our parent portal you will need to click “FORGOT PASSWORD” and then the system will email you the password to allow you first time access. You will be assessed a $10 charge on a declined automatic debit transaction. Replacement transactions must be in the form of cash, check, or money order. The fee for a returned check is $25. A student will not be allowed to participate in class if tuition is not paid in full on any month. If tuition is not paid the student will be dropped and will need to pay a $25 membership fee when he/she wants to re-enroll. There are no refunds on tuition or for missed classes. No matter what payment plan you are on, your child will be enrolled until we receive your drop notice. We cannot issue credit to your account, pro-rate tuition, or refund payment for any classes not attended. Our classes are figured on a monthly basis from the 1st. Our monthly tuition is based on 4 classes per month, but on months that have 5 weeks you get a free week and are not charged. Email in or notify the office if you wish to drop a class or classes. This must be done prior to the 25th of the month in order to avoid your account being charged. What if I start in the middle of the month? You can sign up at any time. Your tuition will be pro-rated according to the week you start. We ask that you pay your pro-rated tuition & annual membership fee at the time of sign up. Payment can be credit card, check, or cash and the following tuition will be on our automated billing system. Annual membership is $25 per student and is due annually according to the startup month and is good as long as the student remains current on classes within the program. Members receive discounts to Open Gym and also to many special events. Members also receive priority enrollment opportunities. ONE “no obligation class” is available to NEW students. These are offered where space is available in a class. A release form must be filled out prior to taking the class. We ask that you let us know within 24 hours after class if you will be signing up at All Starz Academy or not. It is always best to attend your regularly scheduled class whenever possible. If your child misses a class a make-up class can be arranged. Please come to the office and get a make-up slip for the class you missed. This is a courtesy we offer to our customers. Make-ups will be given only where space is available & must be taken within four weeks from the date of the missed class. Once your class is missed your make-up may be scheduled up to one week in advance. Your account will not be adjusted or pro-rated for any classes missed as we have hired instructors to teach the class your child signed up for whether or not they choose to attend. For gymnastics, girls should wear a leotard. Form fitting tank tops and workout shorts may also be worn as long as they are not too baggy & have an elastic waistband. Boys should wear a t shirt & workout shorts. 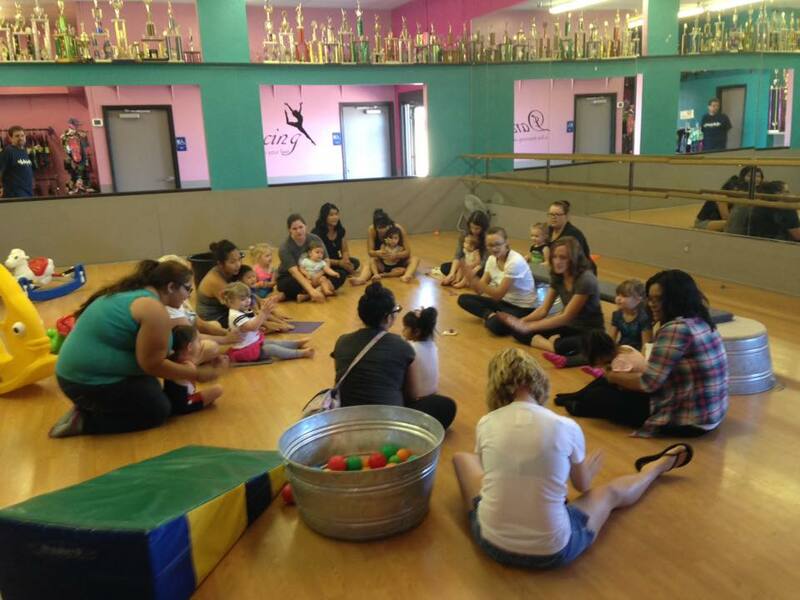 Gymnastics students go barefoot & hair past the shoulders needs to be tied back in a ponytail, braid, or bun. No jewelry please except for small stud earrings. For dance classes, students need to wear dance wear or workout wear that allows for freedom of movement. You may only go barefoot during your first dance class. After that, the proper dance shoes according to dance style need to be worn for class. Are parents allowed to watch? Parents & visitors are welcome to observe classes, but must remain in the observation area at all times. Please do not distract the children by trying to coach/direct your child from the sidelines. Please do not enter the gym or dance room areas for any reason. If you need to speak with a coach please schedule a time at the office. When is All Starz closed? All Starz is closed on all major holidays such as Labor Day, Memorial Day, & July 4th. All Starz is also closed for Thanksgiving Break - Wednesday through Saturday after Thanksgiving. Our annual Holiday Break in which All Starz is closed happens the entire week of Christmas & the week of New Years. Makeup classes will be offered for all closings with the exception of Holiday Break which is an annual scheduled closing. You will still be charged full Dec. & Jan. tuition, but these two weeks are made up by the months with 5 weeks in which you get an extra week of classes at no additional charge. When any of your contact information or billing information changes (address, phone numbers, emergency contact, email, credit card information, etc. ), please inform the office so that we can update your account. Can I schedule a birthday party at All Starz? Stop by the office to pick up a brochure with all the information about our birthday parties! Our coaches do the work for you! Please schedule a month in advance if possible. Parties are normally scheduled on Saturdays from 12:00pm-2:00pm. Can I schedule a private lesson for my child? Stop by the office for information about private lessons. Only $25 for a 30 minute lesson, and you are able to choose the coach yourself! What a great way to get valuable one on one instruction on a skill you have a desire to learn. Children should be picked up promptly after class. Children are not allowed to play on any of the gym equipment or be in the gym areas at any time without coach supervision. Children not in class please remain with parents in one of our waiting areas. All Starz Academy reserves the right to combine or cancel any class with less than four students. If this must be done we will make every effort to find a class time that is convenient for you. All class changes must be handled through our office. All Starz is not responsible for lost or stolen items.